Gartner’s Data & Analytics Summit 2017 in Grapevine, Texas dove into some of the most pressing and vital issues surrounding big data, machine learning and business intelligence. From the rise of “citizen” data scientists to the future of analytics platforms, there was much to learn from not only one of the world’s most prestigious research and analysis firms, but also other attendees. Here are three key takeaways from our time at the Data & Analytics Summit. 1. The future of analytics lies with citizen data scientists. Traditionally, analysis of large and complex data sets has been the territory of highly-credentialled and specially-trained data scientists. The mathematical, computational and engineering knowledge necessary to handle this information restricted the field to those who had the right background. At this year’s summit, however, the concept of the “citizen data scientist” took center stage. As new data analysis platforms - like Visallo - make it easier for professionals from all walks of life to find connections and identify key insights from big data, formally trained data scientists aren’t always needed. While a certain degree of technical knowledge will always be required, a broad array of professions can now get real value from analytics on a wider scale. In short, big data is open to a new class of users who are increasingly able to analyze, explore and interact with critical data to do their jobs - think investigators of fraud, money laundering, crimes and more. 2. Machine learning expectations are very high. Not surprisingly, researchers and data scientists are incredibly excited about the potential benefits of machine learning and artificial intelligence technology. It’s easy to get carried away here, with visions of omniscient computer networks like Star Trek’s shipboard computer - or worse, Skynet from Terminator. But the truth is that machine learning and AI are much more nuanced than these science-fiction depictions, and the field is still in its infancy. Much of the discussion at this year’s Gartner Data & Analytics Summit revolved around how to determine the actual, versus the hypothetical or projected promise, of machine learning. In that regard, there will be successful platforms and those that fail to live up to the hype. The former category will accommodate all types of analytics - from descriptive and diagnostic to predictive and prescriptive - as well as be well positioned to handle the rapid growth and churn of machine learning models and approaches. Visallo falls into that bucket. 3. Platforms must change their approaches and shift from a reactive to a proactive paradigm. For obvious reasons, the general history of data analysis has been backward-looking - trying to figure out what happened, when and with what frequency, in simple terms. While that might have been good enough for the 20th century, 21st century business intelligence will demand a more proactive approach. Going forward, the increasing power and sophistication of platforms will give enterprises and organizations the capacity to predict future trends and events with high accuracy. This proactive capability will be especially necessary for users who require tools to suggest queries and visualizations relevant to the task at hand. Keep an eye open for new proactive features to launch on big data analytics platforms this year. Visallo in particular has some new releases in the works that will empower users in that regard. 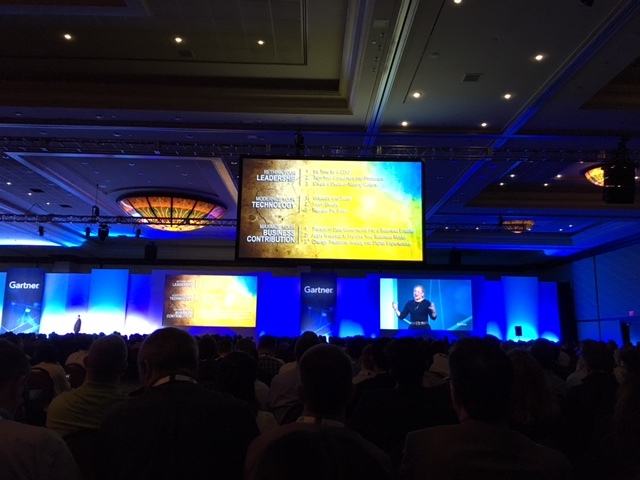 The Gartner Data & Analytics Summit 2017 was a fascinating and insightful event for all in attendance: investigators who need to analyze large quantities of information in their professional life, technology and intelligence officers who oversee the implementation of these tools and developers of platforms like Visallo. If one thing was clear this year, it’s that in the coming months, it will be more important than ever to invest in the most advanced, user-friendly and customizable data analysis and visualization platforms. Download our newest eBook to discover how Visallo is changing the way investigators solve cases and request a demo today to learn if our platform is right for your organization.